Germans like meat almost as much as they like beer. 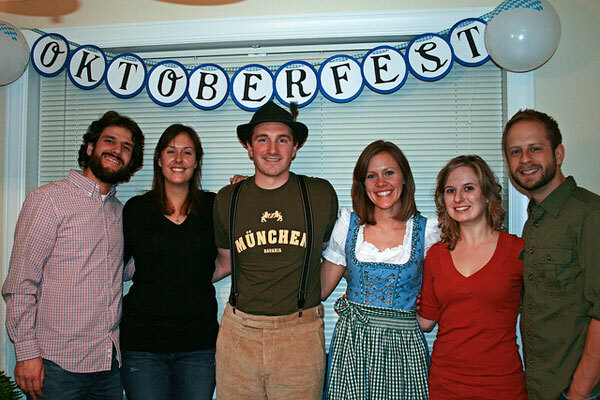 In fact, on the morning of our Oktoberfest party, our fridge was stocked with five pounds of pork for schnitzel, two pounds of elk for goulasch, three types of wursts, and two packages of bacon. And keeping cool in the garage were three cases of beer. In addition to Nick’s favorite potato salad roasted with paprika, thyme, and rosemary and dressed with mayonnaise, Dijon mustard, and Worcestershire sauce, I also made a simple and classic German version. It includes white vinegar, white sugar, and parsley and can be served warm or cold. 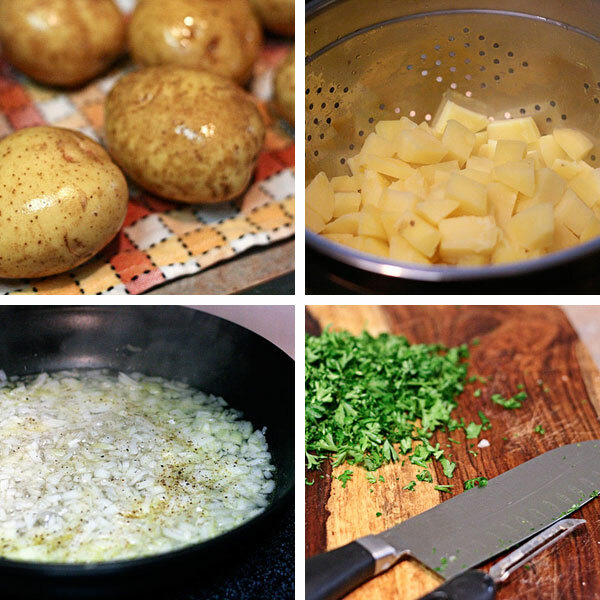 Place the potatoes into a pot with enough water to cover them. Bring to a boil, and cook for about 12 minutes, or until easily pierced with a fork. Drain, and set aside to cool. In a skillet, add onion and oil and cook over medium heat until browned. Add vinegar, water, sugar, salt, and pepper. Bring to a boil, then add potatoes and parsley. Heat through, and transfer to a serving dish. Serve warm or cold. I have to tell you a really terrible story about how I came to know German potato salad. A cousin of my mine was married to a woman who can only be described as a total wench. She was from Georgia; they met while he was in the military. 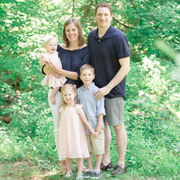 She had one kid; they had two more together, and she left all three with him when she skipped town. They were married for around five years and for most family gatherings this woman would bring German potato salad. It was the most amazing side dish ever. I couldn’t put my finger on exactly why it was so much better than the American version, but I had no interest in cooking at that point. YUM! I am all over both this potato salad and Nick’s favorite. I detest the standard grocery store counter stuff, but I adore a good potato salad done well and a little differently. Thanks! 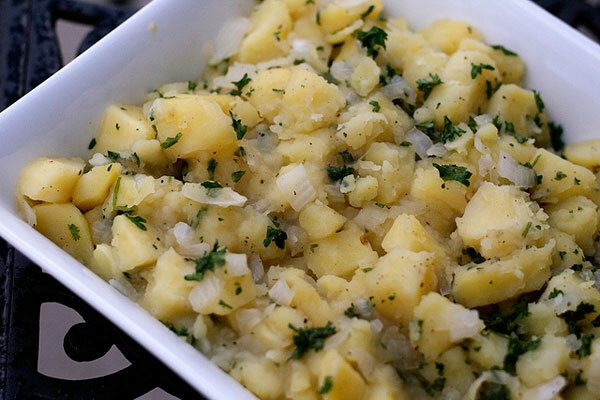 I love German potato salad, but have never made it because my mom’s version is so good. What is it about trying to re-create dishes your mom makes well?! Maybe now’s the time to banish the fear and give it a go! There are so many recipes for potato salad out there. My grandpa showed me the one I love and always use. It does not include meat, but there are pickles, eggs, an apple, onion and more. Hopefully, I can make it for Oktoberfest #2 next year!